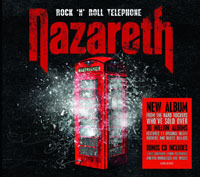 Share the post "Album review: NAZARETH – Rock ‘N’ Roll Telephone"
If this is the last Nazareth studio album with Dan McCafferty – all I can say, is what a way to go! If the album is tinged with a little sadness – after McCafferty announced his retirement due to ill health – it is nevertheless a wonderful swansong. The irony perhaps is that whilst touring is a no-no, the singer hasn’t ruled out further recordings although the band announced Linton Osborne as his replacement. From the catchy opener ‘Boom Bang Bang’, the harder ‘One Set Of Bones’ and the even catchier ‘Back 2B4′ to the heavier ‘Not Today’ and a rocking ‘God Of The Mountain’ the album pretty much sums up all that has gone before. The band had a string of successful albums in their seventies heyday and should probably be more cherished than they are now. They could show a hard rocking, bluesy side and a softer pop-edged twist but always with McCafferty’s gravel-voiced tones in evidence. Their slower side is well represented here by ‘Winter Sunlight’ and ‘The Right Time’. McCafferty who with Pete Agnew (now the only remaining original member) has stayed resolutely faithful to the cause and has left a phenomenal recorded legacy, even if the band became less popular in the 80s and 90s. ‘Rock ‘n’ Roll Telephone’ is an admirable addition if not quite up to the band’s comeback ‘The Newz’ in 2008. This package is bolstered by a second disc with two excellent bonus studio tracks and five so-so live tracks recorded 2000-2008. This entry was posted in ALBUM REVIEWS, ALBUM REVIEWS (Mobile), All Posts and tagged album, bonus, Dan McCafferty, hard rock, live tracks, Nazareth, Pete Agnew, review, Rock 'N' Roll Telephone. Bookmark the permalink.